WASHINGTON (September 17, 2012) – New survey findings, combined with an analysis of historic credit scores and loan performance, show home sales could be notably higher by returning to reasonably safe and sound lending standards, which also would create new jobs, according to the National Association of Realtors®. A monthly survey* of Realtors® shows widespread concern over unreasonably tight credit conditions for residential mortgages. Respondents indicate that tight conditions are continuing, lenders are taking too long in approving applications, and that the information lenders require from borrowers is excessive. Some respondents expressed frustration that lenders appear to be focusing only on loans to individuals with the highest credit scores. *Data derived from a monthly survey for the Realtors® Confidence Index based, on over 3,000 member responses, posted at www.Realtor.org. Hang On Real Estate Investor! The 2013 Tax Hikes are just around the corner! A large number of tax provisions expire at the end of 2012 and new 2013 tax increases will affect everyone. Our first article describes what tax provisions are expiring. The second article provides an overview of the Medicare tax increase for 2013 which could affect your real estate sale. Understanding these tax changes is paramount to your real estate investment strategy for the balance of 2012 and to be mindful of during 2013. Without Congressional action, a large number of tax provisions will expire on December 31, 2012. Every taxpayer will be affected with higher tax rates from payroll taxes to income tax rates. Referred to as the “Bush Tax Cuts”, many of these 2012 expiring provisions were enacted in tax legislation in 2001 and 2003 included lower capital gains tax, marginal income tax rates, no marriage penalty tax and lower estate tax rates. The expiration of these “Bush Tax Cuts” will greatly affect the real estate investors and small business owners whose businesses are organized as “pass-through” entities, where their business gains or losses are reflected on their individual returns. Capital Gains will be taxed at 20% rate, increased from the current 15% rate. Dividends received by individuals will be treated as ordinary income rather than taxed at a capital gain tax rate of 15%. Ordinary income tax rates will increase by 3.0% to 4.6% for those individuals in the 25% to 36% tax brackets. The top tax bracket will be 39.6%. Small businesses with undistributed taxable income will be taxed at the highest individual rate of 39.6% rather than the current 15% tax rate. Estate and gift tax exemption will be reduced from $5 million to $1 million with the estate tax rate increasing from 35% to 55%. For real estate investors entering into a 1031 Exchange transaction would still defer your taxes. Strict guidelines and timing for your 1031 exchange would need to be followed. A Medicare 3.8% tax will be imposed on income from interest, dividends, rents (less expenses) and capital gains (less capital losses). The tax will fall only on individuals with an adjusted gross income above $200,000 and couples filing a joint return with adjusted gross income more than $250,000. This new Medicare tax applies to the lesser of the investment income amount or the excess of the adjusted gross income over the $200,000 or $250,000 amount. For taxpayers selling their principal residence, they will pay the 3.8% Medicare tax only on the amount of gain that excludes the thresholds in Sec. 121 which is $250,000 for singles taxpayers; $500,000 for joint returns. The current statutes provides no guidance if the 3.8% Medicare tax can be deferred by entering into a 1031 like kind exchange when an investment property is sold. Most tax practitioners feel that a 1031 exchange should defer this 3.8% Medicare tax but are waiting for final clarification. Calculated Risk’s Bill McBride points us to a new interview with Robert Shiller, the legendary Yale economist who famously predicted the dotcom and housing bubbles. Speaking to NPR’s Neal Conan earlier this week about housing prices, Shiller continues to be reluctant about calling a bottom in U.S. home prices. However, he suggests when it may be appropriate to say that the housing bottom really is in place. CONAN: And in the spring you were on the fence as those first reports came in giving three months of generally positive data. Do you think we’re coming off the bottom? SHILLER: Well, we definitely have positive data. The question is how strong is it, and will this fizzle – this rally fizzle or not? And I don’t know the answer to that. But I point out that this is the fourth time we’ve had a rally since the crisis ended. It’s coming in the summertime, right? Well, that’s the normal time of strength in the market. So if you look at the data, it doesn’t jump out at you that we’ve reached the turning point. Now, we may have, but I think that seasonality seems to be getting stronger, and that’s another contender. SHILLER: But once you have a year of solid price increases, you are probably off to the races for some years. So yeah, but we’re not into it that long yet. The prime home selling/home buying season is over and the fall season is upon us. August statistics show continuing buyer demand. By the numbers, active inventory is 10,826 homes, 5,196 homes were placed under contract, and 4,685 homes closed during the month of August. Year to date activity is up, Up, UP. 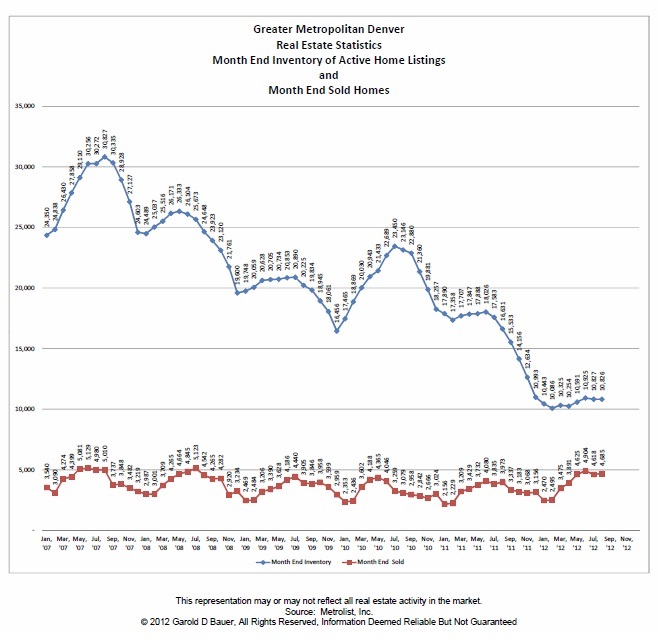 Appraisers are continuing to have a tough time in keeping up with current market valuations. Buyer demand is cooling slightly. Days on market is down, 50plus% of listings went under contract in 30 days or less. Most frequently used forms of financing is conventional, FHA, and cash. Sold homes amounted to a closed volume of $1.3B. Great month and the future looks promising. Footnotes: Active, Pending Under Contract, and Sold presented as # of units. This representation mayor may not reflect all real estate activity in the market.